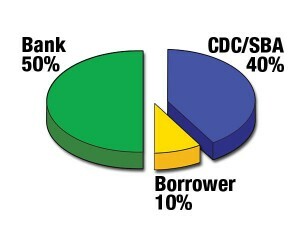 SBA 504 loans have a shared financing structure. Typically, the borrower provides a 10% down payment, a Certified Development Company (CDC) like Self-Help finances 40% of the project, and a third-party lender, generally a bank, finances 50%. The SBA partners with local CDCs like Self-Help to administer the 504 program. We coordinate among the borrower, the bank partner and the SBA to make sure your loan is a success. For real estate loans, the bank portion of the project usually carries a 20- to 25-year amortization and has a minimum 10-year term. The Self-Help (SBA) portion is fully amortizing, with either a 20- or 25-year term. For most equipment loans, the bank portion of the project has a minimum 7-year term and the Self-Help (SBA) portion is fully amortizing, with a 10-year term. Equipment with a 20-year useful life may be eligible for a 20-year term. << What are 504 Loans?